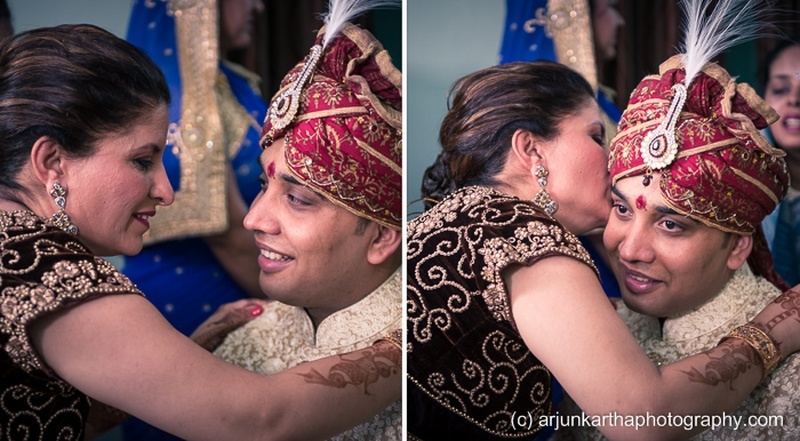 This love affair which began in the land down under will make you ‘aww’ more than you ever have. 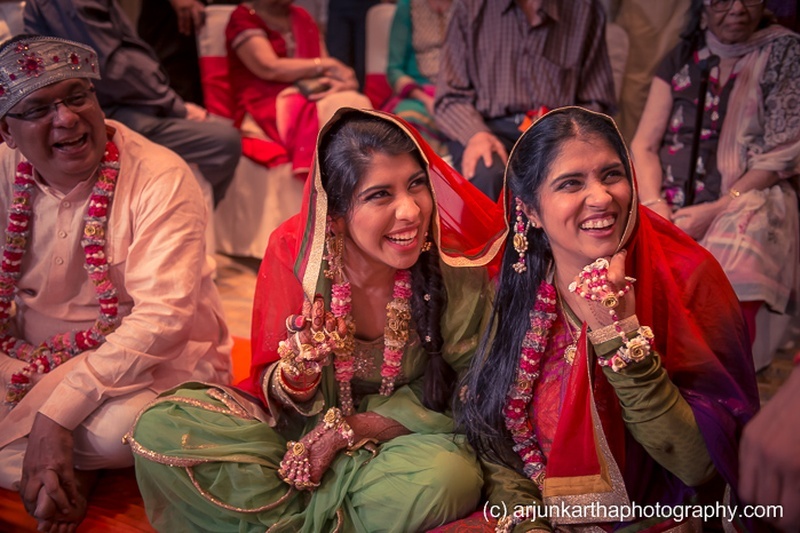 A typical Uni kid and a sweet seventeen-year old girl found friendship at their part time summer job in the wonderful town of Auckland. 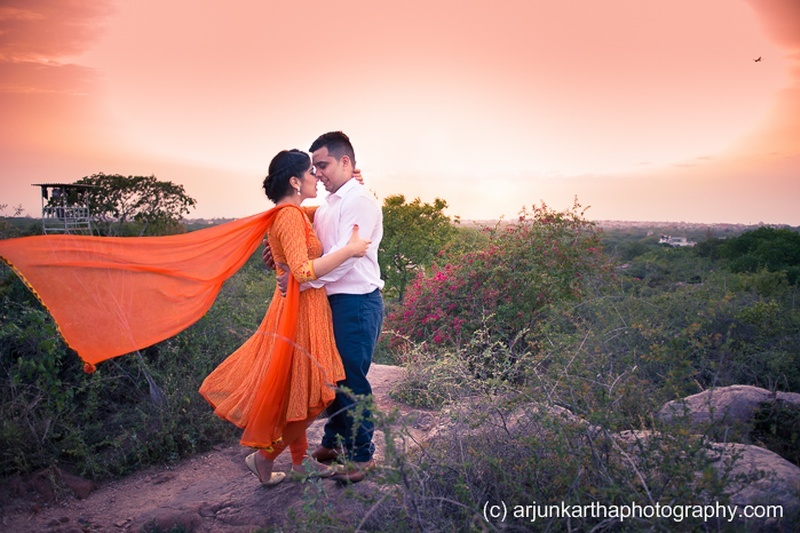 Remember when Simran and Raj went to their respective homes after the Euro trip and realised their love for each other? 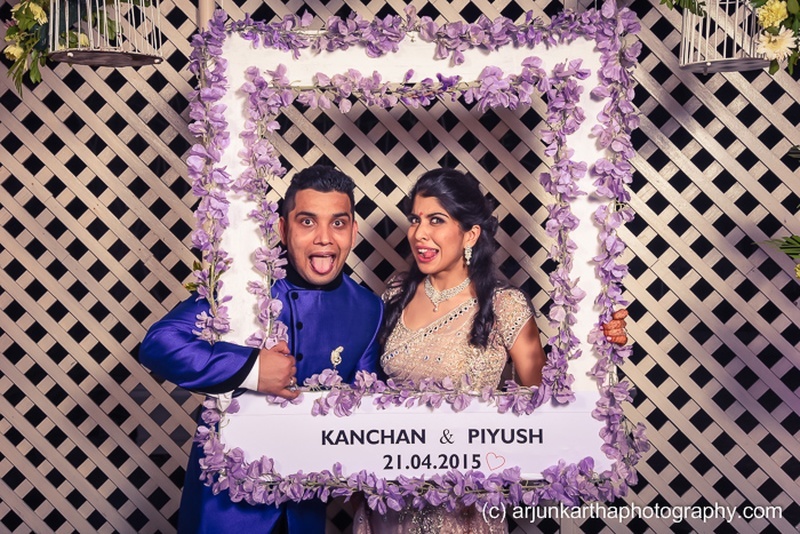 Well, that’s exactly what happened with Kanchan and Piyush (Er, kind of) ! 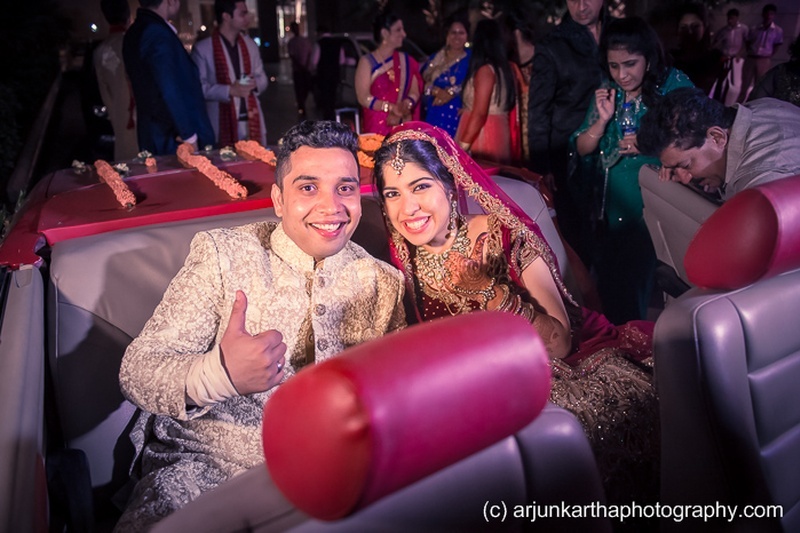 Kanchan moved to Sydney, Australia and the lucky boy in love, Piyush followed his heart that led him right after his future Mrs! 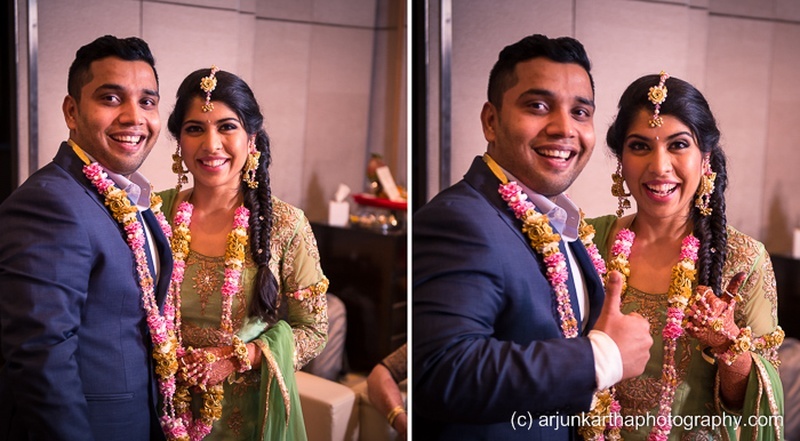 After lots of coffee dates, endless laughter and love that only grew leaps and bounds, they decided to make their very Bollywood love story come alive in a grand, three-day wedding at Taj Vivanta, Delhi, which hosted their mehendi ceremony, engagement and marriage. 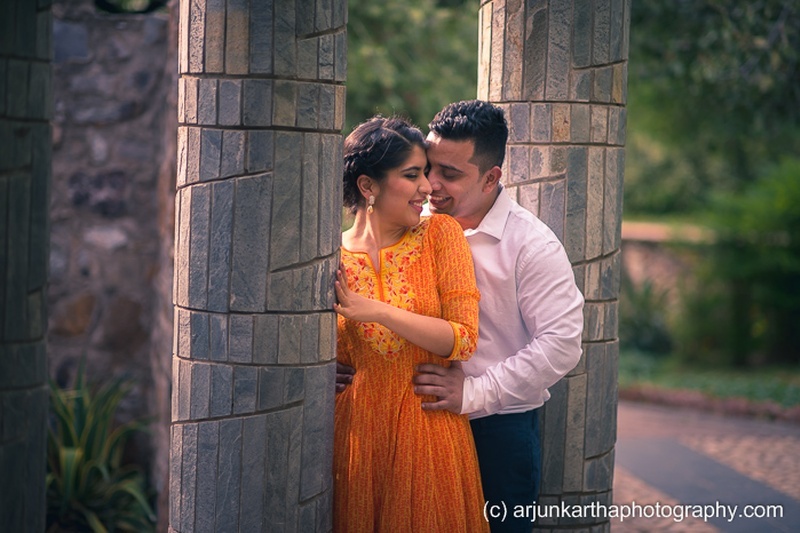 A ballroom lit up in warm hues of yellow with fresh flowers decorated on the stage and white painted birdcages hung beautifully around photobooth frame adorned with lavender – their engagement was done tastefully. 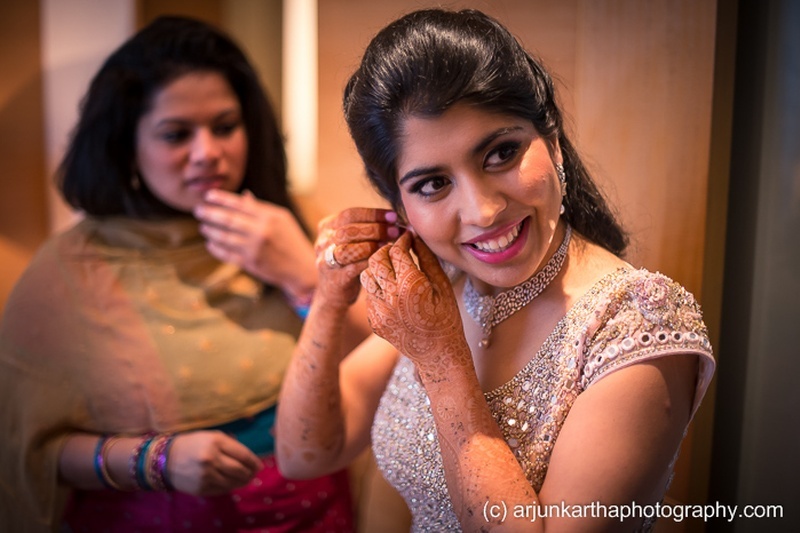 Kanchan opted to wear a pastel shade and balanced out the subtlety with her sparkly diamond jewellery. 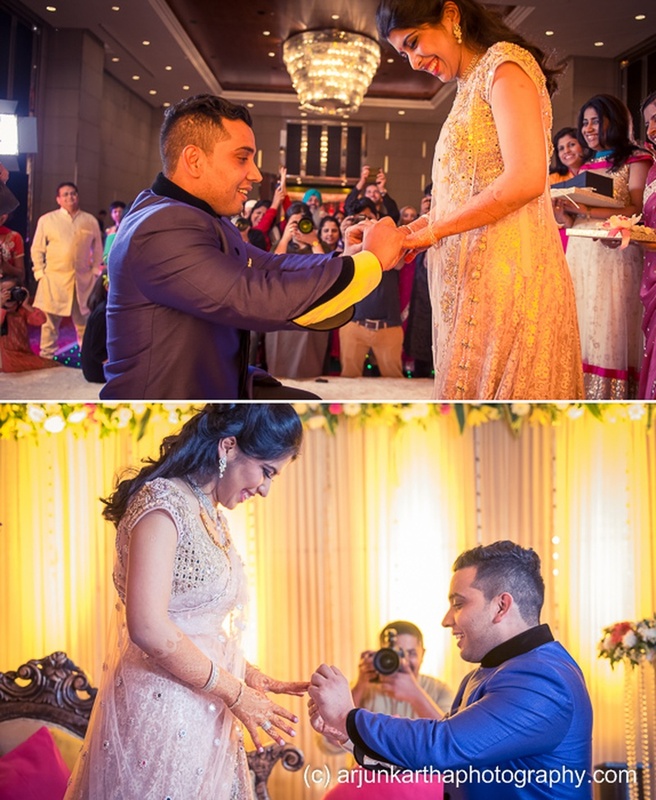 Piyush followed suit with the style quotient in his metallic blue, side-buttoned sherwani. 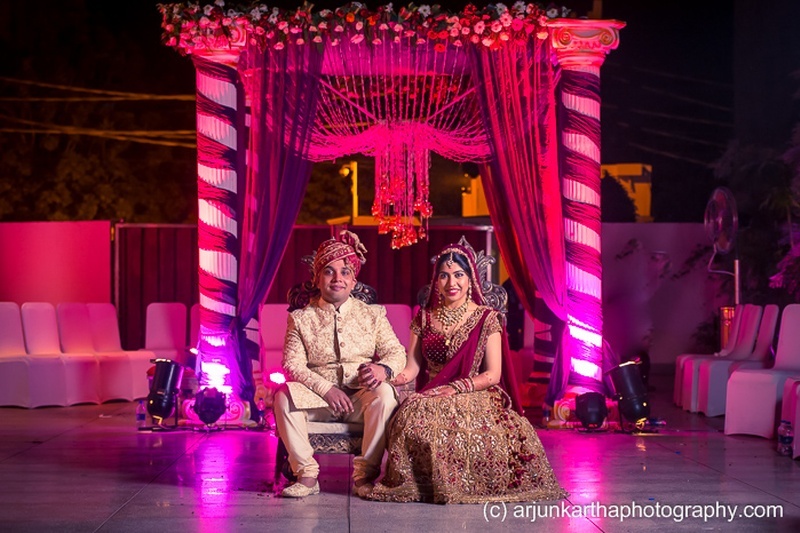 This duo took their Saat Pheras in an outdoor vedi mandap decorated with ornamented gold danglers and drapes in regal colours of purple. 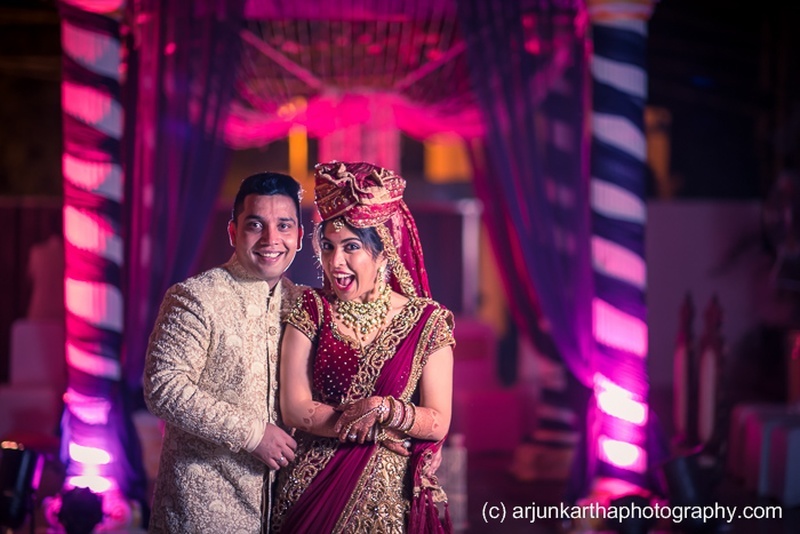 Kanchan’s maroon and gold bridal lehenga looked absolutely ravishing paired with her ethnic polki jewellery while the handsome groom went all-out classic in his white and gold embroidered bandhgala sherwani. 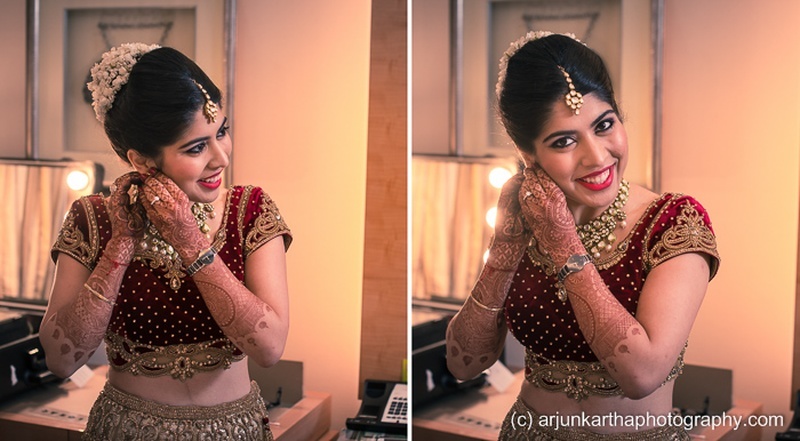 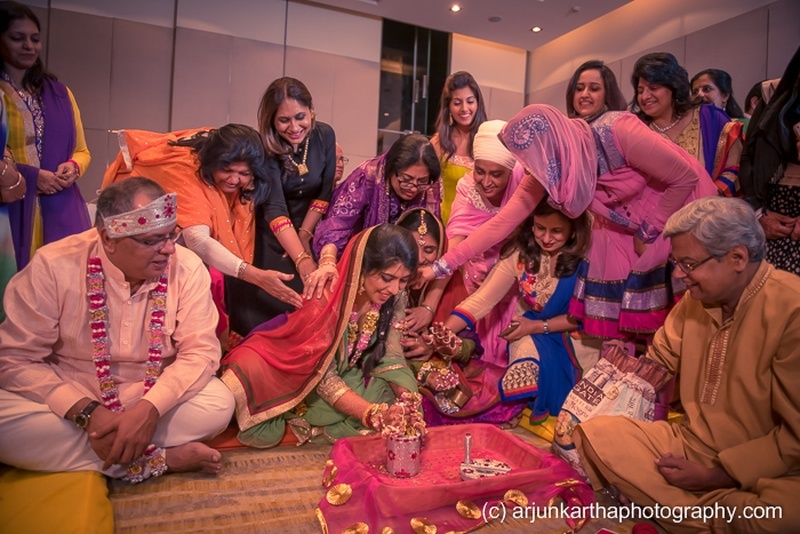 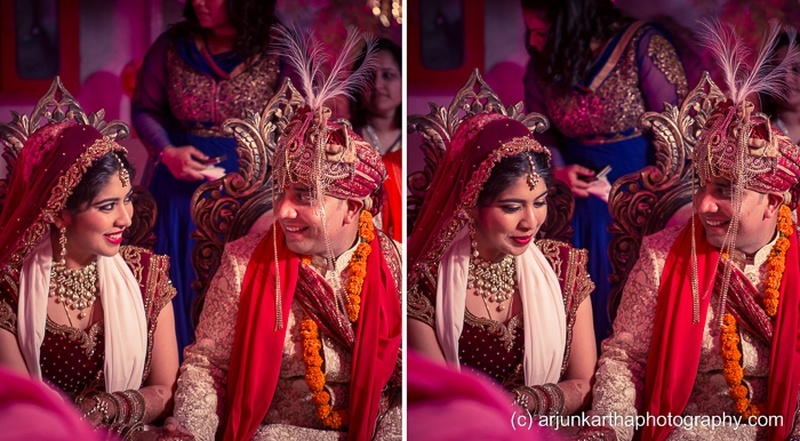 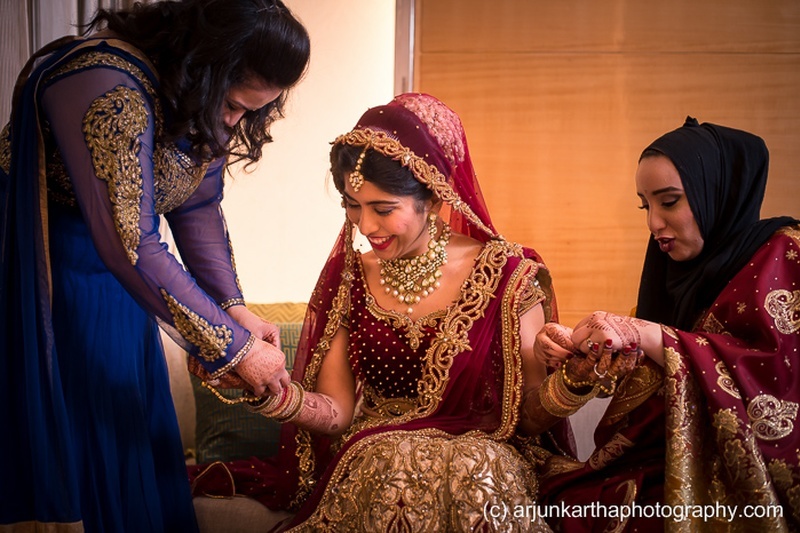 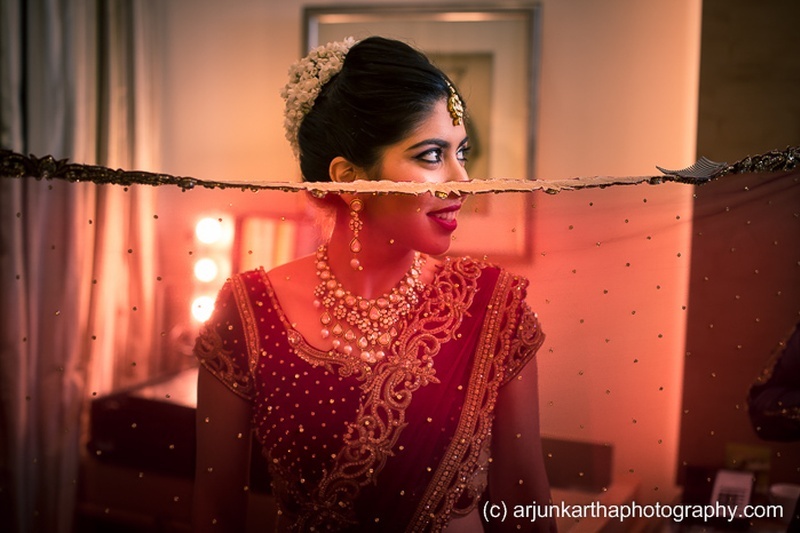 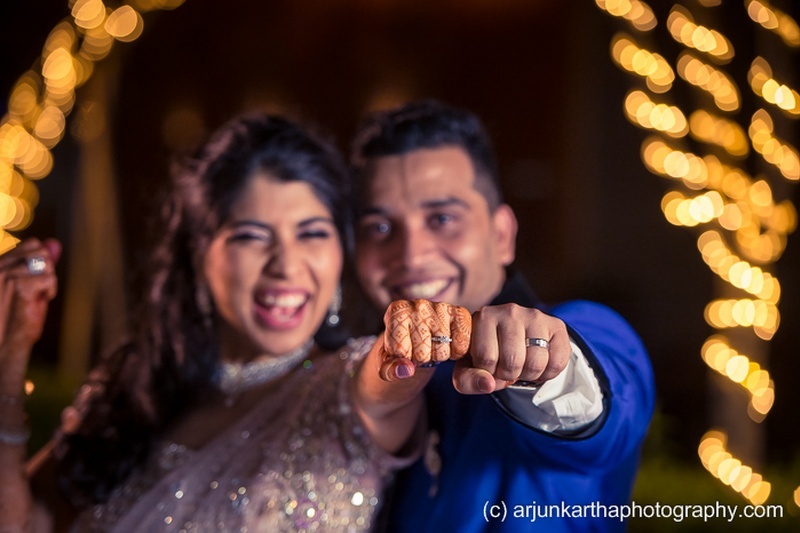 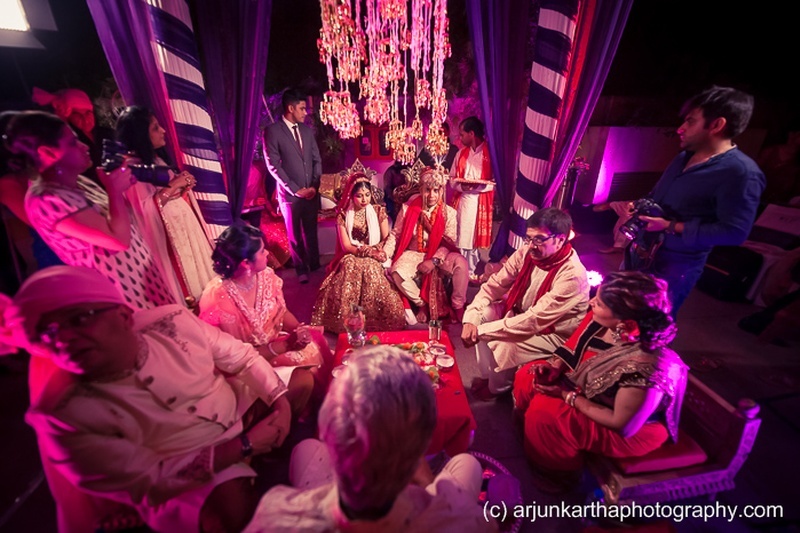 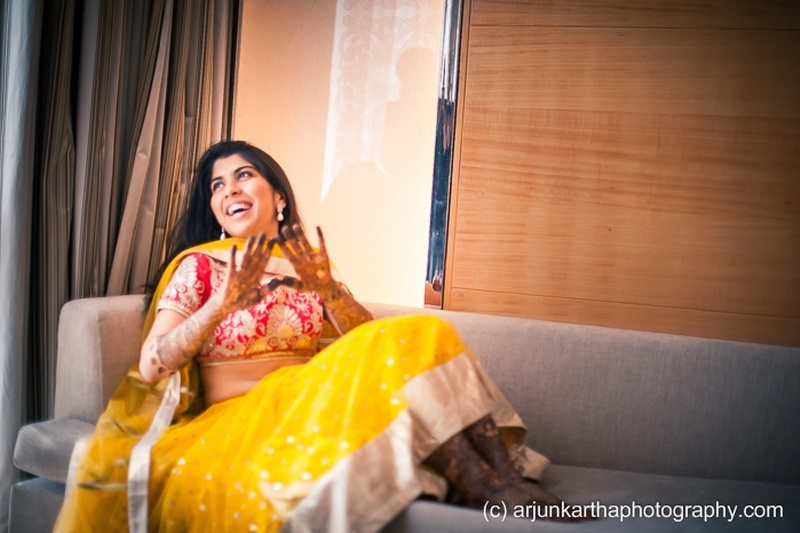 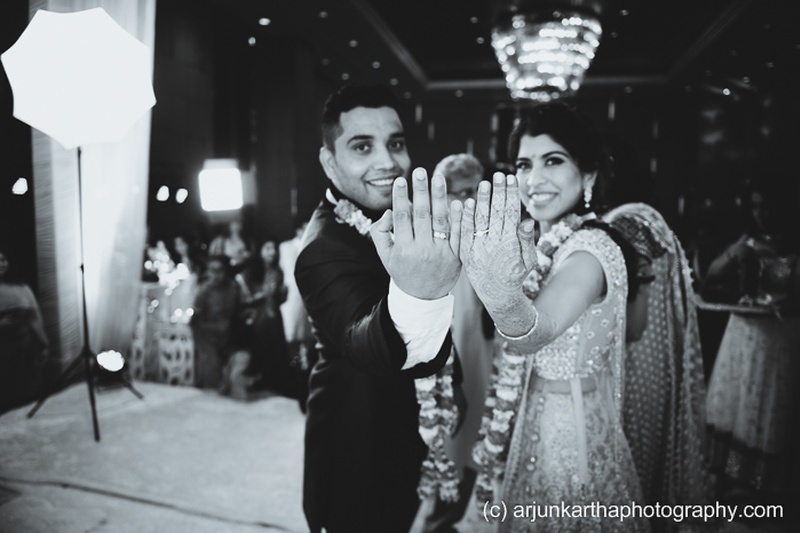 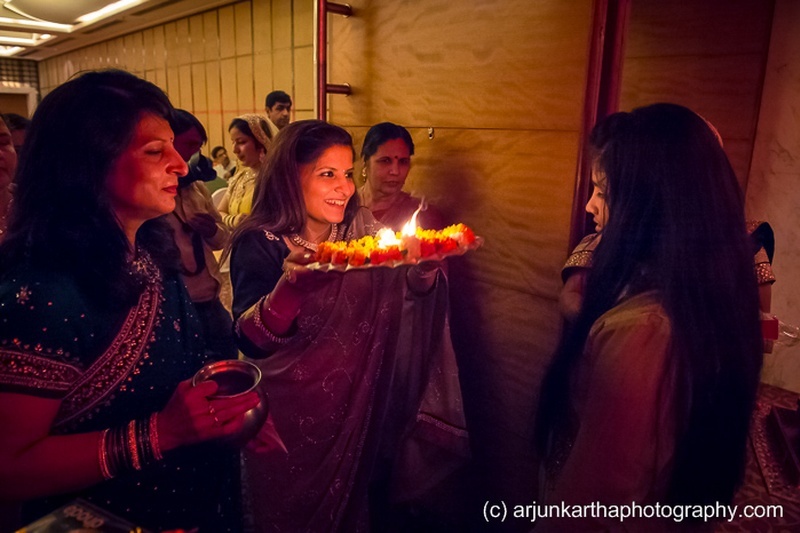 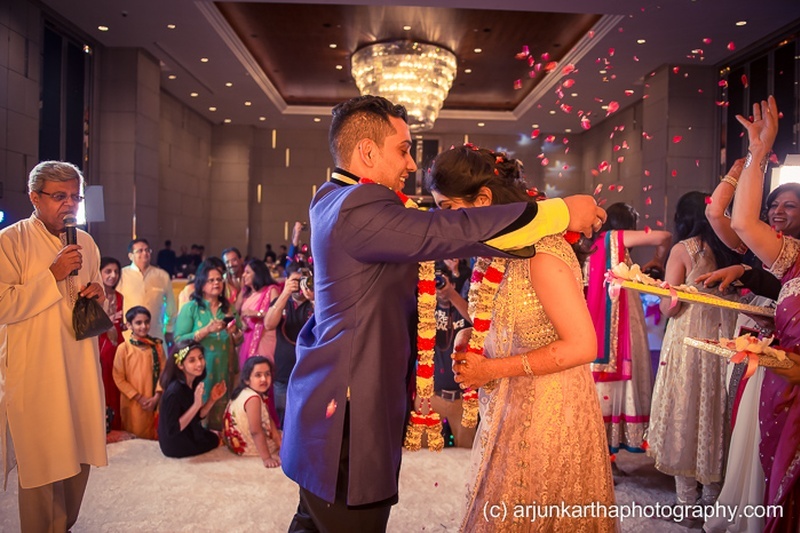 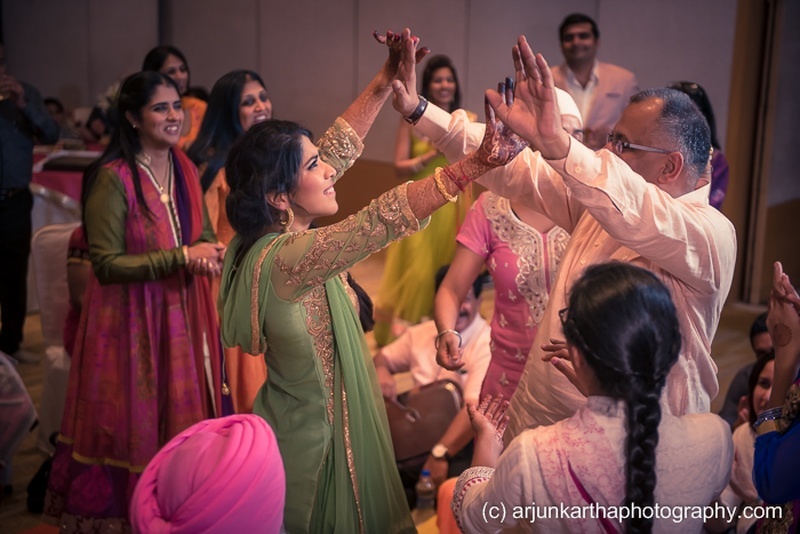 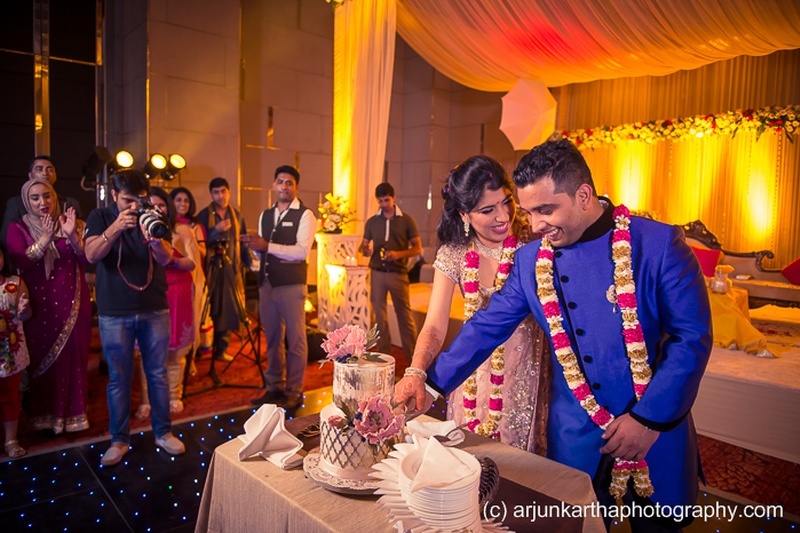 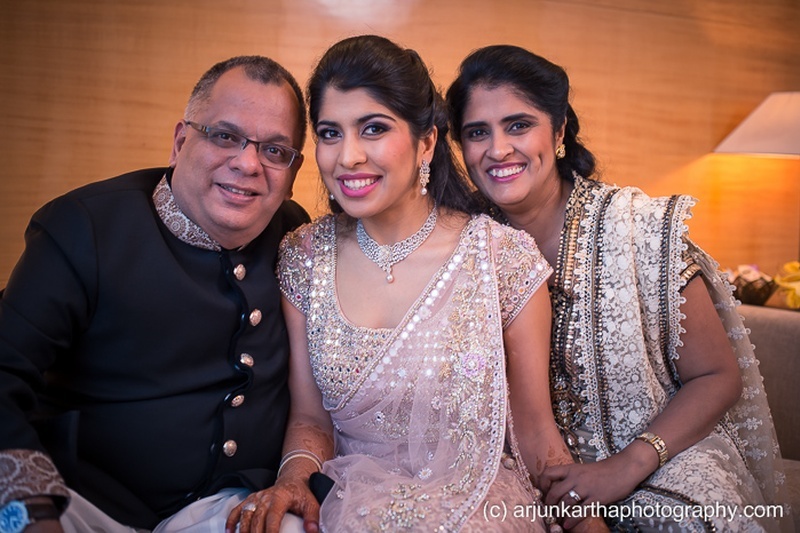 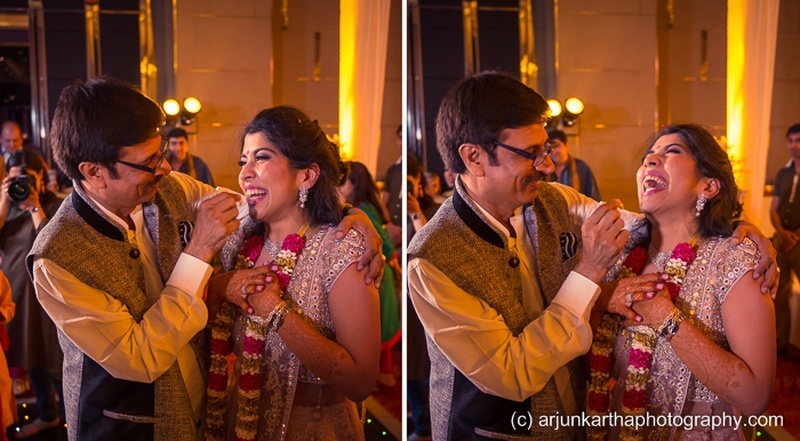 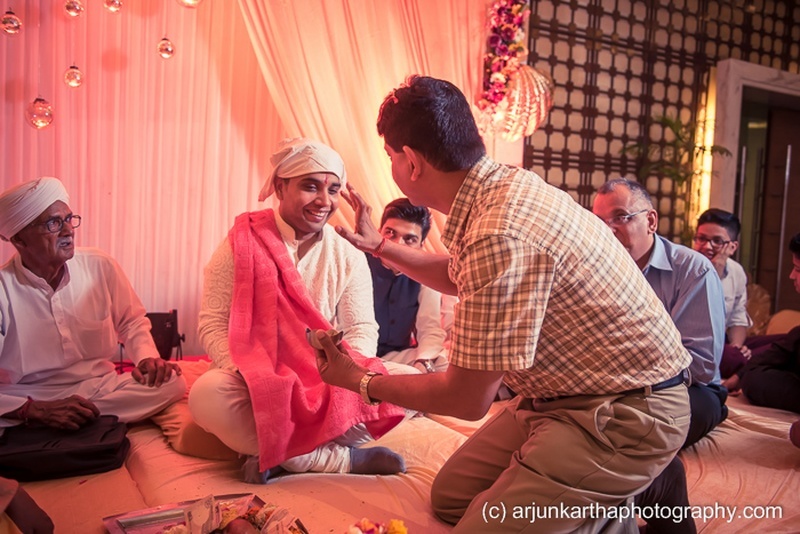 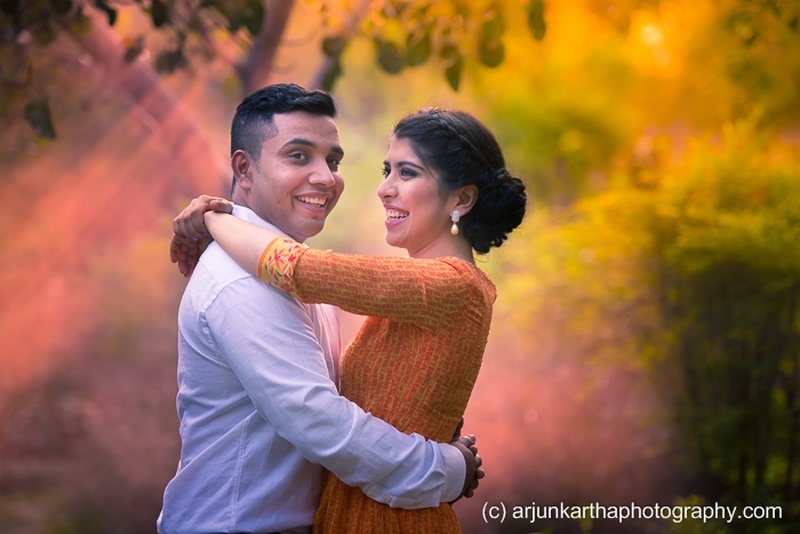 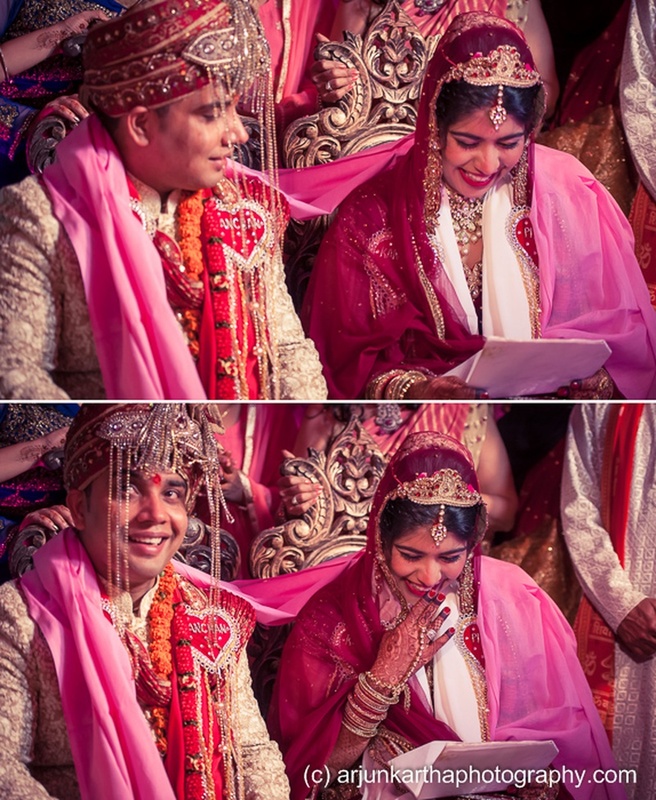 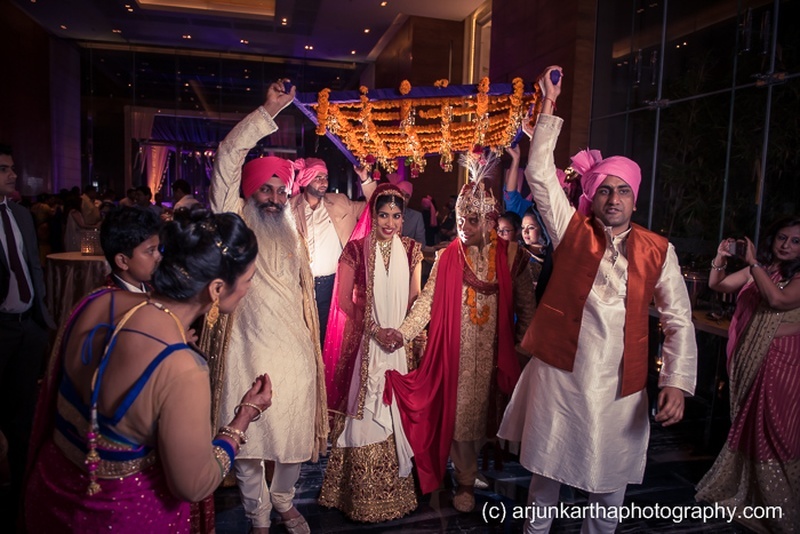 The team at Arjun Kartha Photography captured every emotion in every picture they clicked, helping both, Kanchan and Piyush to relieve the best days of their lives again and again.